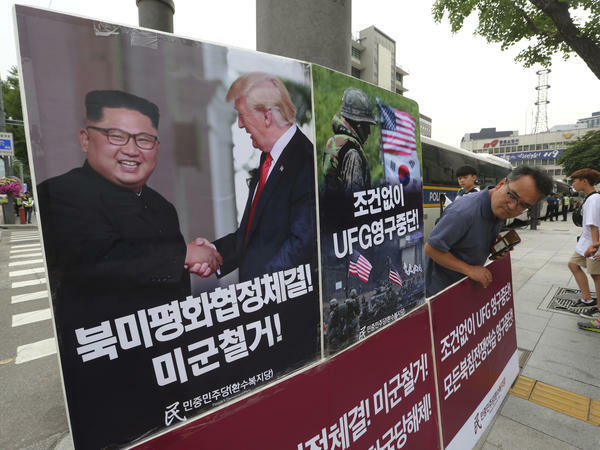 A photo of President Trump and North Korean leader Kim Jong Un is on display as a member of People's Democratic Party stands in opposition of military exercises between the United States and South Korea near the U.S. embassy in Seoul on Tuesday. On Friday, Mattis met with Secretary of State Mike Pompeo, Joint Chiefs Chairman Gen. Joe Dunford and National Security Adviser John Bolton to discuss how "to implement the results of the Singapore Summit," Pentagon spokesperson Dana W. White said. The announcement comes on the heels of the summit in Singapore between President Trump and North Korean leader Kim Jong Un on June 12. Following the summit, Trump announced his decision to end the so-called war-games. "We'll be saving a tremendous amount of money," Trump said in a press conference. "Plus, I think it's very provocative." It was surprising news for some involved, including U.S. ally South Korea. NPR's Pentagon correspondent Tom Bowman reports the decision didn't appear to be planned by the Pentagon before the summit, but was made on the ground in Singapore. Regarding Friday's announcement, the South Korean defense ministry said, "There could be additional measures should North Korea follow suit with productive cooperation." The Pentagon said any additional suspensions "depend upon the DPRK continuing to have productive negotiations in good faith," with the U.S. The U.S. has about 28,000 service members on the Korean Peninsula. The annual military exercises served as a defensive strategy for South Korea, in case of an attack from the North, but also to protect allies in the region like Japan. Foal Eagle, an exercise that already happened this spring, included thousands of troops, aircraft and artillery. Ulchi Freedom Guardian, which was set for August, would have likely involved computer simulated defense exercises. North Korea, for its part, has consistently condemned the drills.